If you’re in Las Vegas for CES and not already staying at a CityCenter Hotel (Aria Las Vegas, Vdara, or Mandarin Oriental), you’ll want to visit CityCenter. You can take a free tram from the Bellagio or the Monte Carlo to get both a view and be dropped off in the middle of CityCenter. Be sure to check out the wooden sculpture and staircases with agates embedded in them – some of the most beautiful woodwork in the city. 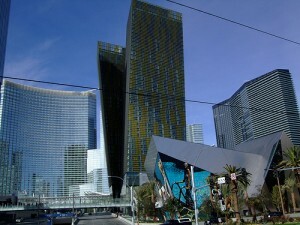 This entry was posted in Las Vegas and tagged aria resort, citycenter, crystals shopping retail, Las Vegas by Joe Hunkins. Bookmark the permalink.